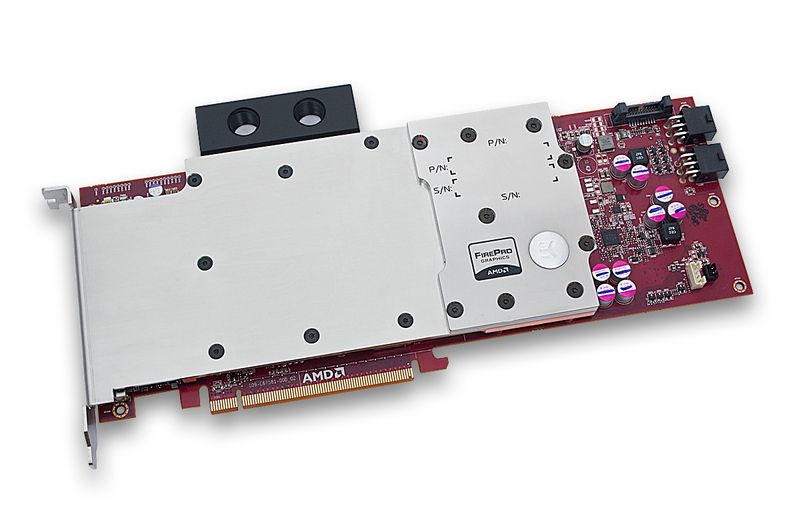 EK Water Blocks, Ljubljana based premium liquid cooling gear manufacturer, is proud to introduce the first dedicated liquid cooling solution for the latest AMD® FirePro W8100 series CAD/CAM graphics cards. 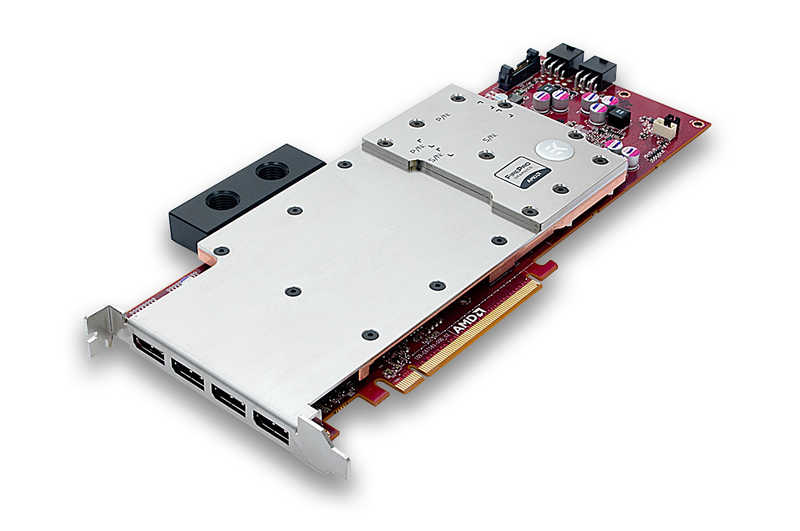 EK-FCW8100 is a Full-Cover water block which directly cools the GPU, RAM as well as VRM (voltage regulation module) as water flows directly over these critical areas thus allowing the graphics card and it’s VRM to remain 100% stable under any given workload. This cooler features high-flow design therefore it can be easily used in liquid cooling systems using weaker water pumps. Base is made of C110 grade electrolytic copper while the top is made of laser cut stainless steel metal plate, which also serves as a I/O bracket. The sealing is performed by quality NBR rubber washers while the screw-in standoffs ensure safe and trouble-free installation procedure. This water block features a very slim design therefore up to seven EK-FCW8100 or EK-FCW9100 water blocks can be used on a single ATX form factor motherboard. Contact us for custom multiple-port FC Terminal built per your demands. A single-slot design also means it is possible to simply double the computing power per unit compared to factory heatsink fan (HSF) cooling solution. Same footprint – twice the power! Using the EK-FCW8100 allos AMD® FirePro W8100 to run at full performance without experiencing any thermal-related throttling issues. "Just like our liquid cooling solution for the flagship AMD® FirePro W9100 graphics card introduced two months ago, this EK-FCW8100 is opening possibilities for vendors to build very powerful and even more cost-efficient GPGPU powered workstations – all within the same convenient PC form factor", says Niko Tivadar, Product Manager at EK Water Blocks. "Our single-slot solution allows for up to seven GPUs instead of four to be installed on a standard ATX 7-slot PCI-Express consumer motherboard thus reducing the number of required computers by as much as 40%"
The product comes with a MSRP of 124.95€ (incl. VAT) and is readily available for purchase through EK Webshop and Partner Reseller Network. Made in Slovenia – Europe!